Today is National Donut Day and there are ample opportunities to pick up free fried dough, but let's not forget: The day as well as the dessert have long and storied histories. Before artisanal types turned their eye to the treat and the Cronut changed the way we think about pastry entirely, the humble donut delighted millions as a dependable, workaday indulgence. Here are some facts you might not know about our glazed friends. 1. There's an inspiring story behind National Donut Day. Unlike so many food holidays that are merely marketing gimmicks, National Donut Day has more noble origins. The Salvation Army invented it during the great depression to raise money for the needy and honor the work of volunteers during World War I. 2. 10 billion donuts are eaten in the U.S. every year. That’s 32 donuts for every man, woman and child. 3. There’s no right way to spell donut. Or is it doughnut? According to the Grammarist, the “donut” spelling is used about one third of the time in American writing, but the international standard is "doughnut." Dunkin’ Donuts is credited with pulling the “ugh” out of donuts. 4. They have developed diet donuts. But do you really want a donut with less fat and sugar? What’s even left at that point? 5. 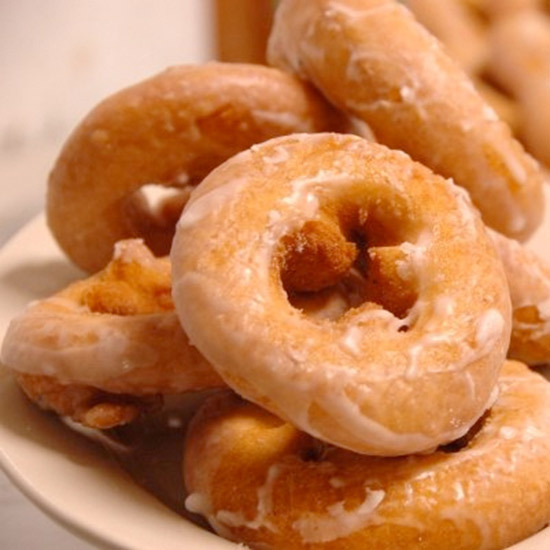 The earliest recipe for donuts dates to the year 1800 in England. According to the most recent research (and my, is there a lot of research) in Michael Krondl’s book The Donut: History Recipes and Lore from Boston to Berlin, a recipe for “dow nuts” appears in the cookbook compiled by British Baroness Elizabeth Dimsdale. The sun never sets on the donut empire. 6. But donuts have ancestors that are much older than that. In his book Glazed America: a History of the Doughnut, Paul R. Mullins writes about 18th century Dutch colonists who made olykoeks, which were similar to beignets. But it's likely that humans have been frying dough for ages. Archaeologists have found fossilized remains that appear to be ancient Native American donuts. 7. The hole in the center was supposedly invented at sea.